We are thrilled to announce the new plan for Greer Stadium. In his first major proposal since taking office last week, Briley delivered music to the ears of historic preservationists, saying he plans to seek Metro Council approval for the estimated $1 million needed to demolish the dilapidated former minor league baseball stadium and start the process of restoring the land as a park. NASHVILLE — In 1978, the city of Nashville leased 18 acres of a Civil War monument to a local businessman who wanted to start a new baseball franchise — the Nashville Sounds, then a Double A expansion team for the Southern League — and needed a place for his team to play. It was a ludicrous arrangement from the start: a privately owned ball field built on public land. Historic Nashville Inc. took a victory lap of shorts while presenting their plans for this year’s preservation projects. The group held its annual meeting at Fort Negley on Thursday night. Two weeks ago, Cloud Hill Partnership announced it was withdrawing from a contract to redevelop the former Greer Stadium site. Thursday’s meeting was all about the future. With the clock ticking until Mayor Megan Barry’s proposed May 1 referendum on a legacy-defining, $5.4 billion transit plan, she now has two fewer controversies that could have muddied the path to win approval of the monumental project. Over a two-day stretch last week, Barry retreated from a pair of contentious fights — one involving Nashville General Hospital; the other Cloud Hill, the much-disputed redevelopment project previously planned for Greer Stadium — that had showed no signs of simmering down. 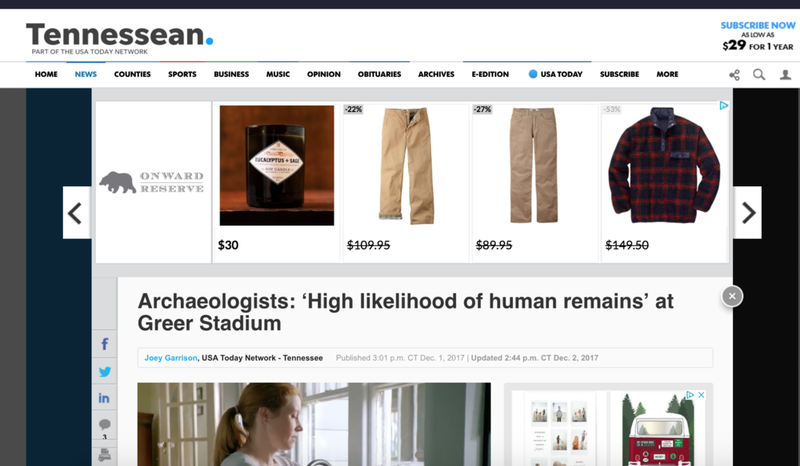 Developers halted plans Friday for a sprawling entertainment and residential complex in Tennessee after archaeologists discovered what they believe are graves on a site near a Civil War fort built by slaves. The decision gave preservationists a victory in the latest clash between historic conservation and growth in Nashville, a booming city with a complicated racial past. Sandra Lee Weaver talks with historian professor Dr. Lee Williams on the history and importance of Fort Negley. After months of criticism, Cloud Hill, the much-disputed mixed-use plan for Nashville's former Greer Stadium site, has withdrawn its proposal for the city-owned site. Controversial Nashville City Council member Colby Sledge admitted in sworn testimony at a Metro Council Board of Ethical Conduct hearing earlier this month into conflict of interest complaints filed against him that he participated in a secret meeting between “a top Barry aide and two partners who would later form Cloud Hill” in late 2015, The Tennessean reported on Wednesday. After laying out a vision for the former baseball stadium, developers backing the proposed Cloud Hill project were met with opposition from those citing the property's historic connection to the Union army's Fort Negley. The Cloud Hill team had proposed a mixed-use development for the 21-acre site with housing, a maker space and retail. While Mayor Megan Barry supports the development plan, she has paused the project as Metro awaits an archaeological review for potential human remains. A preliminary report determined a “high likelihood of human remains” on portions of the property. Talks between leaders of Cloud Hill — the controversial development proposed for Greer Stadium — and Mayor Megan Barry’s administration took place more than one year before the city formally kicked off the process to redevelop the site and began accepting bids. But the mayor’s office maintains informal meetings about Greer Stadium during this period were not unique to Cloud Hill and did not influence decisions. They say the city had an open ear to all suggestions. Sledge’s testimony before the ethics commission supports Sandhu’s contention that Cloud Hill Partners had an inside track on the contract. Did the Barry administration exert undue pressure on the judging? Given Kelley’s involvement in selecting the panel of judges, it certainly raises the possibility. For Sandhu to win his lawsuit in Chancery Court, he will have to prove collusion on the part of the Mayor, her staff, and city employees like Gossage, Kelley, and Sloan who pushed, along with Colby Sledge, to award the development contract to the Cloud Hill Partner group. That will be no easy task. City officials say they handled the bidding for the Fort Negley RFQ no differently than the way they normally handle city contracts. Sandhu will have to convince a judge not only that the city’s handling of the Fort Negley RFQ was unfair to him but also that the “normal” way the city awards contracts is discriminatory and corrupted by insiders with political influence. I always say, and I firmly believe, that we don’t know what the future might need from the past. Dr. Fleming didn’t know that she had any connection to Fort Negley until she happened across those names. And now she can take her family to stand where her ancestors stood. To put their hands on the rocks those ancestors placed. And, if we don’t screw it up, they will be able to walk where their ancestors camped out. If we leave them the grass to do it in, they can lay down on the same ground their ancestors slept on and know that they are the future their ancestors dreamed of in that very spot. Brooks is right. This is a chance to preserve a place which can do that kind of important, personal work for people. It won’t come again. Country music star Kix Brooks has joined the opposition to Nashville Mayor Megan Barry's proposal to redevelop the old Greer Stadium property. Another voice is joining the opposition to a controversial redevelopment of the old Greer Stadium site near Fort Negley. Country star Leon “Kix” Brooks — half of the country duo Brooks & Dunn and owner of Arrington Vineyards — has made a passionate plea for turning the property into a park. In post on his verified Facebook page that he begins by writing, “There is a battle looming in Nashville,” Brooks writes that plans for the controversial Cloud Hill development — led by Bert Mathews, T Bone Burnett and Tom Middleton — should not go forward. 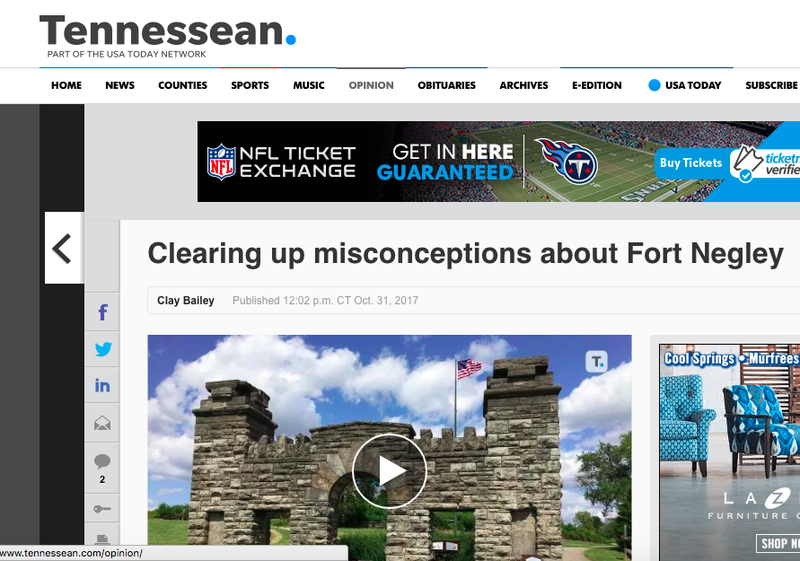 This December, 155 years after the Fort Negley was completed, "Save Nashville Parks" released a video they hoped will spread, educating people about Fort Negley and its history, and continuing a movement for preserving the site amid plans to develop 21 acres of the site. Nashville’s only remaining Civil War-era fort, Works Progress Administration amenities, and the foundations of an African American neighborhood developed after the Civil War all make up the rich historical fabric of Fort Negley Park. A now-abandoned stadium and parking lot built in the late 1970s were recently bid out for mixed-use development, despite the city’s promises that this space would return to parkland. Saturday marked 155 years since the construction of Fort Negley, a Union stronghold in the Civil War-era that was built by conscripted African Americans. Historians said they believe there were 2,771 men and women who helped construct the fort. Even though they were promised pay, many were forced to work in harsh conditions. As Mayor Megan Barry pushes for the redevelopment of Nashville’s abandoned Greer Stadium site, a preliminary archaeological review has determined a “high likelihood of human remains” on portions of the property. The Greer assessment is outlined in an interim managment summary by Tennessee Valley Archaeological Research, which the mayor’s office contracted in October to determine what historical remains are under the city-owned former home of the minor league baseball's Nashville Sounds. In August, I started following Fort Negley Park on Twitter. To honor the 2,771 African-Americans conscripted to build federal fortifications in Nashville, Fort Negley Park started to tweet each name. Knowing nothing about the fort, I recognized those names needed to be honored. Reading and liking each one was the least I could do. 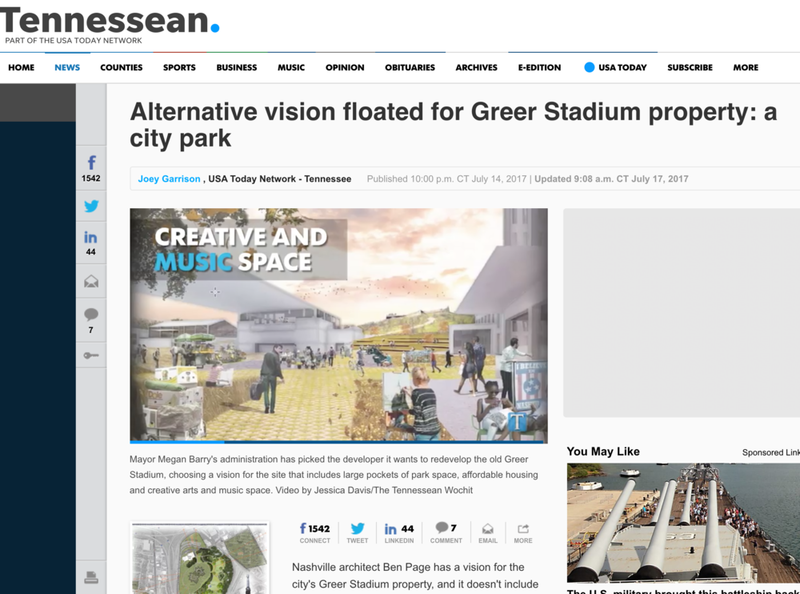 There is an overwhelming flaw in Mayor Megan Barry’s Cloud Hill project to redevelop the empty Greer Stadium. It sits squarely on public parkland containing the most important African-American site in Tennessee’s and, arguably, our nation’s history... Fort Negley is on the National Register, protected by historic zoning overlay, waiting on formal UNESCO World Heritage Global Slave Routes designation and is a National Park Service Underground Railroad location. Ask your city council member to put just 15% of those funds appropriated to "unpave" our paradise at Ft. Negley Park -- before the developers put up a boutique and a swinging hot spot. According to figures by Hawkins Partners, who wrote the 2016 Plan to Play and provided costs to the city for the "unpacking and paving" of land at the Fairgrounds, that's twice what it should cost to "unpave" this paradise. People like Mayor Barry. She is a charismatic woman. Young girls, and those who love them, are proud of her role as the first female mayor. All of Nashville cheered alongside her through the Predators remarkable season. All parents mourned with her at the tragic loss of her son. And this is the crux of the challenge - she is liked. As we share the story of what is happening at Ft. Negley the first question always is, "Wait, Mayor Barry is supporting this?" Heflin's analysis found that the runner-up bid for the right to redevelop the 21-acre site of the shuttered Greer Stadium near downtown, adjacent to the historic site of Fort Negley, generates millions of dollars more for Metro than the winning pitch from a group led by high-profile Nashville developer Bert Mathews, renowned music producer T Bone Burnett and Wall Street veteran Tom Middleton. "What I did was a standard technique of comparison. If it would have been close, I would have kept my mouth shut," Heflin said in an exclusive interview. "But it's pretty glaringly different." Imagine if a city government was debating whether to develop land that had been a cemetery for centuries. It would be unthinkable ... Now that Chestnut Hill is quickly becoming a “desirable” neighborhood, sites such as Fort Negley and its unrealized potential are at severe risk of elimination or significant negative impact. Why Not Give All Parks to Developers? 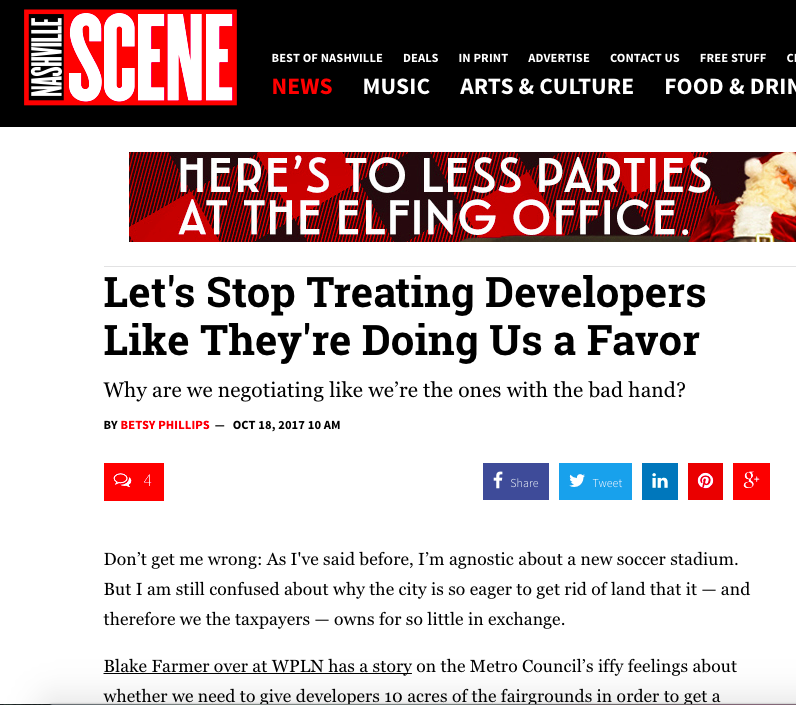 Jessica Bliss over at The Tennessean has the latest argument being floated by Cloud Hill development supporters for why Nashvillians should just acquiesce to giving the developers a huge section of Fort Negley Park to put a neighborhood on — apparently it just makes fiscal sense. In the past, it’s been relatively easy to forget that our most cherished parks and publicly held lands are not, in fact, invincible. This year, however, has served as a wake-up call. Following an executive order signed on April 26, the federal protected statuses of 27 individual national monuments, either designated or expanded since 1996, are being reassessed by Interior Secretary Ryan Zinke. But if there’s one thing we should learn from the Fort Negley Park debacle, it’s that even if the city promises these are just leases, and the land will return to open space for the whole neighborhood, apparently we can’t trust that. The understanding for years was that when the lease on Greer Stadium ended for whatever reason, that land would return to the park. 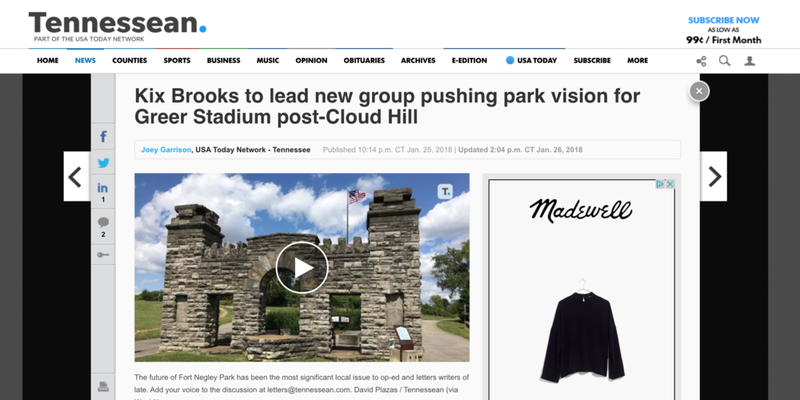 Nashville's Fort Negley is drawing attention from another national organization, this time by a group that celebrates cultural landscapes across the U.S., as historic preservationists fight a controversial mixed-use development near the Civil War-era fort called Cloud Hill. Should We Believe Cloud Hill Supporters? "My gravest concern about the Cloud Hill proposal is that it continues our grand tradition of lying to ourselves in order to not have to see what we’re truly proposing. There is no “Greer Stadium site” that is separate from Fort Negley Park. That is and always has been parkland." 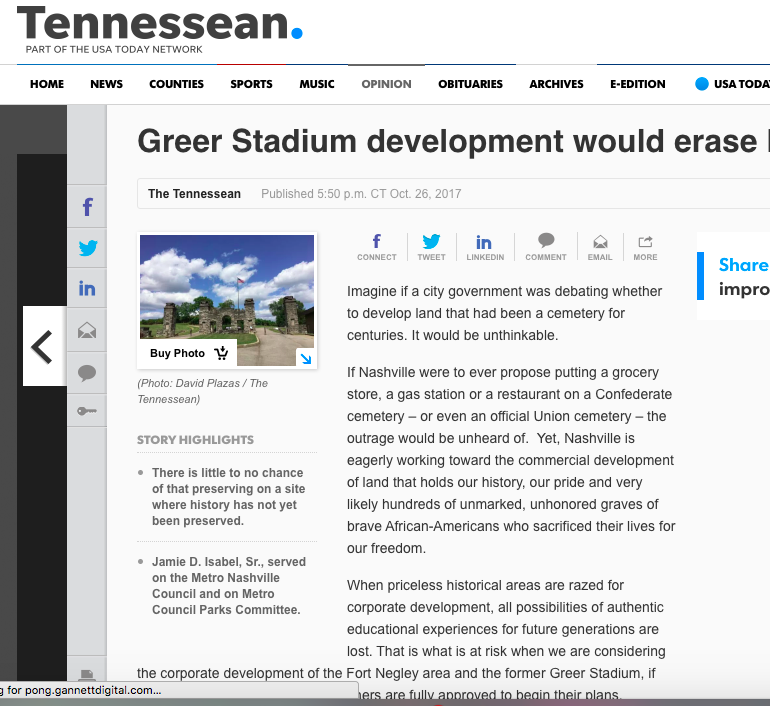 "But park advocates, Civil War historians, and Friends of Fort Negley have demanded that the Greer Stadium site be turned into a public park and returned to Fort Negley Park. Nashville's branch of the NAACP recently came out in opposition of the project and in support of a park." "Now is the time to call on city leaders to commit the funds to appropriately protect this hallowed ground at Fort Negley where African Americans fought and died to preserve our Union." Do the Cloud Hill Developers Even Know Whose Graves They Should Be Looking For? 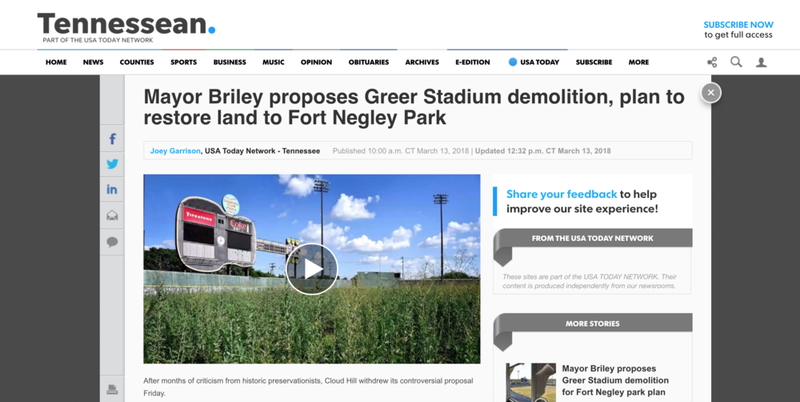 "The Greer Stadium site is in Fort Negley Park. It doesn’t have to be 'considered' for park space. It IS park space." "The at-large members say they are especially concerned about tarnishing the historical value of the property. The site was home to an African-American encampment during the Civil War. The federal military base Fort Negley was built adjacent to the land, and that site has already been preserved." It is not Metro Parks’ role to act as impartial judges on matters of parkland. They’re supposed to be partial. They’re supposed to protect the goddamn parks. "You can see why pro-development folks have been rhetorically splitting up the park into 'Fort Negley' and 'Greer.' If you believe Greer isn’t a part of the park, then, obviously, any part of Greer that becomes parkland seems like a real bonus. But once you know that the Greer land is already part of Fort Negley Park, then there’s no getting around the fact that 58 is less than 60. We will have less park than we originally had." "Page said now is a 'moment of redemption' to make amends for Nashville's decision in 1978 to build a minor league baseball stadium next to a historic fort and the graves of slaves who built it." Now Regular Old Parks Aren't Good Enough? "We’re talking about converting parkland into a neighborhood. Once that precedent is set, what’s to stop it from happening in other parks?" "Let’s defend the legacy of African Americans who struggled here for freedom. Let’s make it a park for all of Nashville to enjoy, filled with historical reverence and the joy of community. 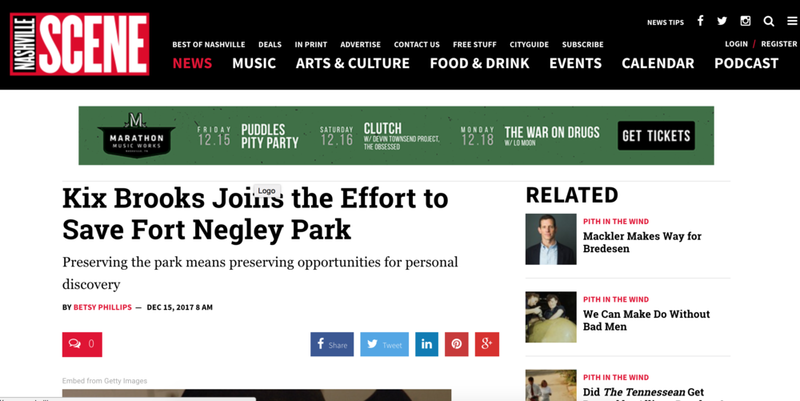 Let’s save Fort Negley Park." Can Tennessee's Great Love Affair With Nathan Bedford Forrest Save Fort Negley? "We know the state legislature is chock-full of men and women devoted to protecting our Civil War heritage, especially if that heritage comes on horseback, has a head of fantastic wavy hair, and swoon-worthy piercing eyes like Nathan Bedford Forrest. But when I asked around about which state legislators had come to Community Day at Fort Negley or had expressed any concern about the park, the only one people could remember hearing from was Brenda Gilmore." "And then in 50 years, when our grandchildren ask us how this could have happened, we’ll all shrug and claim we didn’t know any better. That’s just how things were back then. We do know better, though, Nashville. We do." "It's one thing to sell our heritage to development, its another to get nothing in return for it," Cooper said..."I am for the parks keeping (Greer) as green space," Cooper said. "My point is if they're going to sell it, which they are, they should begin to get its actual value as opposed to making it, in effect a gift." "'It would be like building housing in the middle of Central Park or in the middle of Hadley Park and I think that is unacceptable. It’s pretense to lease or sell the peoples’ land to a private group of people who can really do what they wish to do with it,' said Lovett." "It’s the pinnacle of bad decision-making to set the stage for encroaching concrete to do what forested overgrowth once did in diminishing Fort Negley. In a metropolitan area trying to meet demands for green space, herein lies an opportunity to do both and secure for future generations one of the most important African-American historical sites in Civil War history." How Do We Balance a City and History?